The Black-chinned Weaver Ploceus nigrimentus is a large, dark-backed weaver with a yellow rump, black chin and throat contrasting with the yellow underparts. The female resembles the male but the top of the head is black. 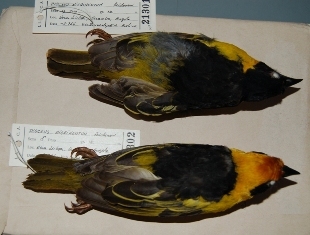 The male resembles 'Reichenow's Weaver' P. baglafecht reichenowi of E Africa, but the Black-chinned Weaver male has the nape yellow rather than black. The Black-chinned Weaver was first described in 1894 (although with an invalid name), but was not illustrated until 1963 (see right). The Black-chinned Weaver is known from south-east Gabon, central Congo-Brazzaville, western Democratic Republic of Congo, and the Bailundu highlands of central Angola (see red areas on map right, based on Birds of Africa). It is localised but not uncommon outside of Angola. The global population has been estimated as at least 10000 pairs. It is very scarce in Angola and only ten specimens of this species are known from this country, including two in the Lubango Bird Skin Collection (see photo above left, and news). 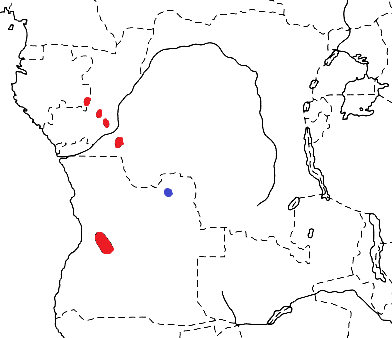 New sightings in recent years were reported from a new area - near Capaia in north-eastern Angola (dark blue circle on map). No subspecies of the Black-chinned Weaver are recognised. The Black-chinned Weaver inhabits open savanna with bushes and trees up to 8 m tall, often near gallery forest. It occurs in pairs or small groups but keeps to the tops of low trees. Grass seeds and insects have been recorded as food items. Breeding information was unpublished until recently (see news). The Black-chinned Weaver nests in small colonies, with up to ten nests in a single tree in Gabon. The nests are very large for weavers, woven mostly from coarse grass, giving a slightly untidy appearance. 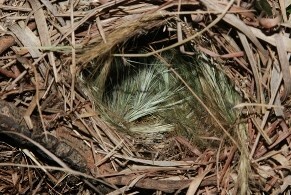 A collected nest was lined with finer grass, and had a ceiling (a layer of grass placed against the roof inside the main structure). The nest entrance is located on the side but near the top of the nest. The eggs and chicks, breeding season and other aspects of breeding biology of the Black-chinned Weaver are still unknown. The Black-chinned Weaver has 2 PHOWN records, but many more PHOWN records are needed for this species (see PHOWN summary). Submit any weaver nest records to PHOWN (PHOtos of Weaver Nests) via the Virtual Museum upload site.